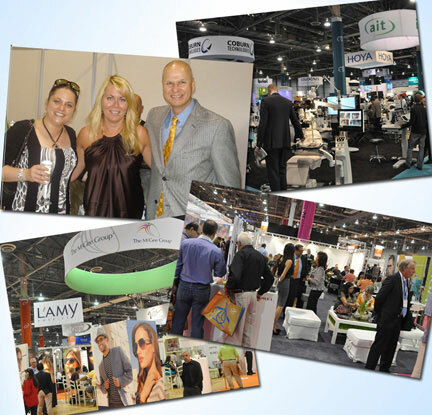 There was plenty to celebrate at the annual Vision Expo West in Las Vegas this September. According to most accounts, the show held its own in the face of continued challenges to the American economy. That alone is cause for celebration. And Canadian exhibitors were happy with the business results of the show, as you will read in a moment. Representatives of Jobson Medical Information (JMI), publishers of Vision Monday, 20/20, and other information brands in the optical industry, attended the reception to share the excitement generated by the new sales and marketing partnership between Jobson and Breton Communications, the two leading optical publishers in their respective markets. As announced in Vision Expo Daily (the VEW news magazine published by Vision Monday) on September 7, the two publishing houses have signed an agreement that ensures better services for optical suppliers, retailers and eyecare professionals in both countries. The show floor was abuzz with this exciting news, adding even greater energy to the anniversary celebration and complementing the overall high energy of the show, says Breton. The strategy worked well for Obadia, and the fact that she has new distributors in the U.S.added to her success at the show. “Our distributor and sales reps are doing a great job for us, so we had plenty of appointments.” Obadiah’s overall impression of the show is that attendance was down, despite her personal success. Next year, International Vision Expo West will be held October 2-5 in Las Vegas.